More than 60 undergraduate students at The University of Toledo spent the past three months delving deep into research projects, including the effect of algal bloom toxins on the development of oysters, a mother’s influence on the accuracy of childhood memories, and the effect of nicotine on ovarian cancer cells. Two of the students translated Korean plays for presentation to American audiences, and four students participated in the Toledo Internship Program with the city of Toledo. Students will present their work at the End-of-Summer Research Symposium Thursday, Aug. 4, from 9 a.m. to 4 p.m. in the Student Union. Oral presentations will be in Room 2582; poster presentations will be in Room 2584. Dr. Andrew Hsu, UT’s new provost and executive vice president for academic affairs, will give opening remarks at 9 a.m. Dr. William Messer Jr., UT vice president for research, will address the crowd at 2:20 p.m. 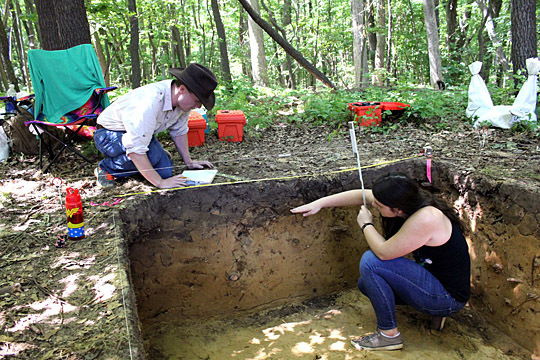 Most of the projects are funded through the Office of Undergraduate Research. For a full list of research projects, click here. 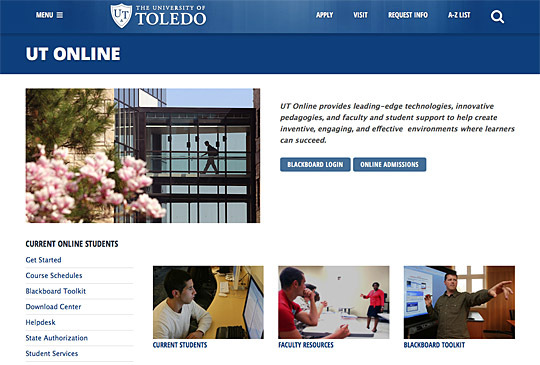 Three University of Toledo faculty members recently received special certification to teach their students online. By completing the Pathway to Master Online Instructor Program, launched in August by UT Online, Dr. Claire Stuve of UT Online, Dr. Ruthie Kucharewski from the College of Health Sciences, and Dr. Daniel French from the College of Languages, Literature and Social Sciences are licensed to provide quality online education for students in the University’s fully online programs. Barbara Mauter of the College of Adult and Lifelong Learning completed the program as well, in October 2015. These instructors followed the steps laid out by Pathway, including lessons in online teaching, Americans With Disabilities Act compliance, online course design, and the Quality Matters peer review process and rubric, and are certified Master Online Instructors. “The Pathway Program was designed to help faculty develop the knowledge and skills needed to design quality online courses and deliver effective online instruction with technology,” Phoebe Ballard, director of instructional design and development, said. In the course design portion of the program, instructors are introduced to the Backward Design method. The Backward Design framework begins with the identification of the desired results, with an emphasis on student learning, according to Ballard. “As a professor, it’s my nature to want to learn, so I signed up for the courses so I could improve my online teaching abilities and increase my level of understanding course design so that I can challenge and meet the needs of my students,” Kucharewski said. The ability to take these courses in a largely online format is also a benefit to instructors. The differences in student needs are further highlighted by the Americans With Disabilities Act course, which looks to close the gaps in education for those with distinctive learning needs. The now-certified faculty members agree that these courses provide a more comprehensive look at student needs in the online environment. “I learned a lot and it was definitely a worthwhile experience, because I have now experienced online learning as a professor and a student, and I understand teaching online so much more than ever before,” Kucharewski said. If faculty would like to learn more about the Pathway Program, they are encouraged to contact Ballard at phoebe.ballard@utoledo.edu or 419.530.4379. 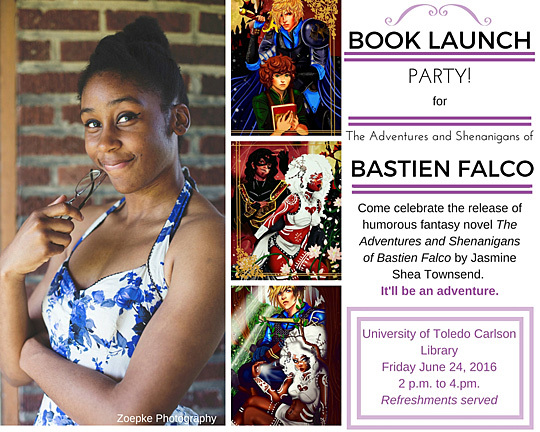 University of Toledo alumna Jasmine Shea Townsend will launch her new book, The Adventures and Shenanigans of Bastien Falco, on Friday, June 24, at 2 p.m. in the Ward M. Canaday Center for Special Collections on the fifth floor of Carlson Library. The free, public event will include readings of selections from the book by Townsend. Described by Townsend as a comedic fantasy novel, the book follows the adventure of Prince Bastien and his manservant, Sandy, as they seek revenge for the murder of the prince’s bride-to-be on their wedding day. In the process, the prince and Sandy are kidnapped by a mysterious woman and her gang of bandits. Townsend received her bachelor of arts degree in creative writing from UT in 2013 and her master of arts degree in literature in 2015 also from the University. Previous works by Townsend have received Mill Magazine’s spring 2014 fiction award and a second-place award for a short story in 2015 from the Toledo Writers’ Workshop. Refreshments will be served. Copies of the book will be available at the event for $10. For more information, contact the Canaday Center at 419.530.2170. “I guess I didn’t realize everybody’s kitchen didn’t sometimes smell like oil paint and turpentine, and that it was unusual that sometimes when you got up in the middle of the night to go to the bathroom, your mom would be up at two in the morning painting,” Tim Sanderson reflected with a smile. He cites his mother as a major influence for his interest in art. Sanderson, college computing administrator, and Dr. David Nemeth, professor of geography, have worked collaboratively on several projects while at The University of Toledo — Nemeth writes, and Sanderson illustrates the sardonic works. The pair most recently teamed up for their third collaborative piece; this one is about wild pigs. Nemeth explained that he examines what it would be like if pigs were free beings, rather than factory farmed for the sole purpose of being eaten. 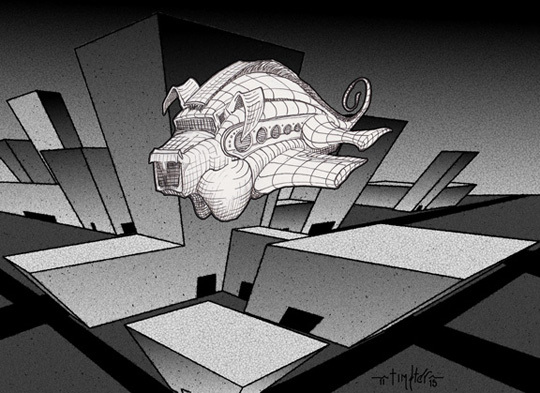 But Nemeth liked what Sanderson came up with, and the flying pig was included. “Space, Time and Pig” will be published in Ecology, Conservation and Management of Wild Pigs and Peccaries (Cambridge University Press) later this year. Top winners of the Shapiro Writing Contest and Shapiro Revision Contest from all academic disciplines were honored at the recent Shapiro Writing Contest gala. There were 57 winners out of nearly 200 entries, and the top two winners of each Shapiro Writing Contest category were invited to the gala. Each winner received a certificate and prize money deposited into their student account. “The submissions this year were truly impressive in their level of critical thinking as well as their academic and aesthetic value. I think for all of us who teach in the English Department, it is very rewarding to be able to recognize our students for the good work they do,” said Suzanne Smith, chair of the Shapiro writing contest committee. In addition to these winners, the English Department scholarship winners, the Outstanding Student in English Award winner, the Richard M. Summers Graduate Essay prize winner, and the top five winners of the Shapiro Revision Contest were recognized at the gala. The awards are possible thanks to an endowment by Dr. Edward Shapiro, UT professor emeritus of economics. Shapiro had a love for writing and donated the funds used for the contests to reward and recognize UT students for their good writing. The University of Toledo will host the GLOBE Midwest Region Science Fair Saturday, May 14, as students will share what they’ve learned from their research on the Earth’s changing climate conditions. About 25 students joined by their teachers will present their research projects from 9 to 11 a.m. in the Student Union on the UT Main Campus. Students will then hear a keynote address presented remotely from Thailand by researchers there studying mosquitos and participate in student and teacher activities. An awards presentation will take place at 3 p.m. Global Learning and Observations to Benefit the Environment, known as GLOBE, is an international science and education program that connects students, teachers, scientists and citizens from different parts of the world to conduct real, hands-on science about their local communities and put in a global perspective. In partnership with leading science organizations such as NASA and the National Science Foundation, the GLOBE Program sparks student curiosity and interest in science. The Midwest region of the GLOBE Program includes Ohio, Michigan, Indiana, Illinois, Iowa, Minnesota, Missouri and Wisconsin. The U.S. Environmental Protection Agency awarded The University of Toledo nearly $500,000 to prevent invasive species from entering the Great Lakes through bait shops, outdoor outfitters, pond suppliers and pet stores. The project funding is part of $12.5 million in 2016 Great Lakes Restoration Initiative grants announced May 4 by the U.S. EPA and Congresswoman Marcy Kaptur at the Ottawa National Wildlife Refuge. Stepien is working with Dr. Kevin Czajkowski, UT professor of geography and planning, and director of the UT Center for Geographic Information Sciences and Applied Geographics, and Dr. Andrew Solocha, UT associate professor of finance. The team will use UT’s newly developed DNA diagnostic tests to analyze fish and mollusks purchased from retailers. Researchers will detect invasive species, diagnose supply chain sources, and pilot a voluntary “Invasive Free” certification program for retailers. The EPA has awarded Great Lakes Restoration Initiative grants to UT researchers for several projects over the last few years, including development of the early detection DNA technology for high-risk invasive species, as well as wetland restoration that helps prevent bacteria from entering Maumee Bay. 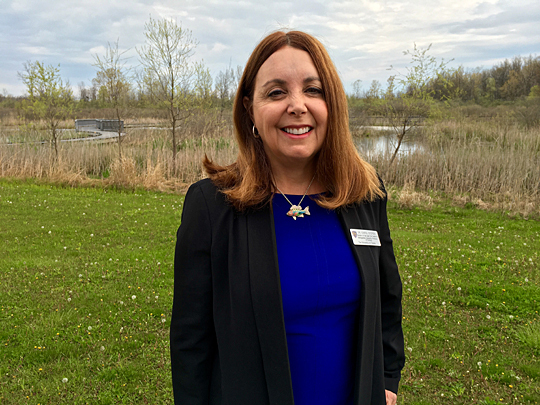 “With support from a strong alliance of bipartisan senators, representatives, states, tribes, municipalities, conservation organizations and businesses, the Great Lakes Restoration Initiative will keep making strong investments to resuscitate the lakes,” said Cameron Davis, senior advisor to the U.S. EPA administrator.